The Professional Certificate Program in Machine Learning is strategically designed to make you a competent authority in the enticing world of Machine Learning by introducing you to the fundamentals and dynamics of Machine Learning. Become a coding specialist in R & Python. Learn Classification (Linear, Decision trees, Kernel estimation, etc.) and clustering (Linear and Non-Linear) techniques along with their applications. Learn Virtual Assistance through various Machine Learning concepts. Has been one of the most prominent market researchers of the country in the last decade and has worked in the top three multinational MR agencies of India - The Nielsen Company, TNS and IMRB International for 13 years in different functional and leadership roles. He was Associate Director at Nielsen and Group Business Director at IMRB International. 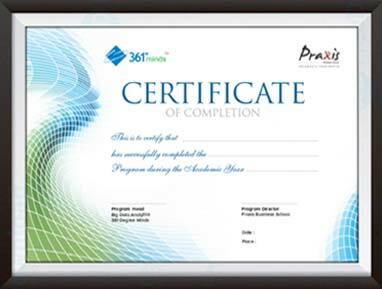 Praxis Business School, Kolkata, is a premier B-School whose courses are rated among India's top two in Big Data and Analytics domain. It is one of the most trusted and influential management education institutions in India. Praxis Business School is motivated by the desire to generate business professionals who can partake in and add to the economic development of the country. This course involves 120 hours of Live Faculty session and recorded live session. It also has multiple guest lectures every month. Along with live classes, the course has industry catalyzers, opinion polls, observers and self-assessments. As a trending career of 2018, the demand for Machine Learning Experts has hit the ceiling. There is a surplus of Machine Learning jobs today than there were in the last 5 years, but not enough ML Experts to keep up with this soaring demand. Make the most of this growing opportunity by becoming a Certified Machine Learning Expert with this Post Graduate Program in Machine Learning today. The new and exhaustive data science skill set acquired through this online, machine learning certification course would enable you to build your career optimally. Professional certificate program in machine learning is one of the key requisites in any large organization. The time is at its best for someone to take up a career in this domain. Enormous opportunities and extreme dearth in getting candidates force large organizations go helter-skelter. It is imperative that career seekers grab this opportunity. Machine learning is a branch of Data Science. It is an application of Analytics that gives computer systems the ability to "learn" from data and improve from past failures/experience, without being explicitly programmed to do so. According to Wikipedia, data science is an interdisciplinary field that uses scientific methods, processes, algorithms and systems to extract knowledge and insights from data in various forms, structured and unstructured. With the onset of Artificial intelligence and the growing use of Machine Learning, the future of professions is quickly shifting to a technology centric one. Machine Learning is revolutionizing and the demand for Machine Learning Exerts increasing rapidly. Choose this program to get into a career that is here to stay. This Machine Learning Program gives you an advantage over others as it gives you an all-round training in Machine Leaning where approach, methodology and execution is concerned. Is there a job market for Machine Learning Professionals? Yes, the job market is ripe for Machine Learning Professionals. According to a report by Gartner, AI will create 2.3 million Machine Learning jobs by 2020. India is facing a shortage of ML Experts and the demand for these professionals is already soaring. Get skilled and get hired to bag these job opportunities today. Is this the right Certification for me? If you are fascinated with the world of Data Science, and you find things like Artificial Intelligence and Machine Learning exciting, then this is the certification for you. There are no eligibility criteria as such. But this program is ideal for IT and Engineering students.